Many employees dread the annual review, that yearly session in a sterile conference room where they find out how they’ve performed over the past 12 months. A manager checks boxes or gives ratings while most employees receive an average score of “meets expectations.” Tom DiDonato believes that type of performance review is flawed. In fact, in his role as senior vice president of human resources for Lear Corporation, he has removed traditional performance ratings entirely. Instead, Lear has developed a review process called “Talking Points,” where employees meet with their managers four times per year to discuss progress against goals, soft skills, and development plans linked to individual career aspirations. The move helps him attract, equip, and retain top talent at a massive organization whose 115,000 employees operate in 36 countries and generate $15 billion in sales. From there, DiDonato was forced to discover and build effective strategies for hiring creative employees. Instead of asking candidates their alma matter and GPA, DiDonato started using more probing questions to uncover true potential. “People might not be great at math, but maybe they really have an eye for color,” he explains. The approach helped him build a team capable of running attractive and efficient retail hubs filled with popular consumer items. 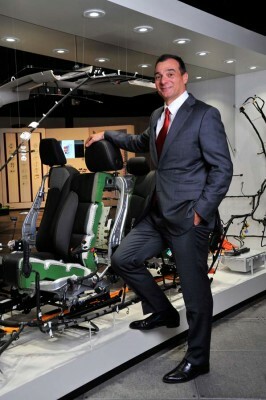 DiDonato must cast a strong and clearly communicated vision that his team can implement throughout Lear Corporation. He’s worked with direct reports to create scorecards used to fill open positions. “They’re not job descriptions,” he says, “but a document that outlines exactly what must get done in a specific position.” For example, grow share by 5 percent, restructure a region, or build a sales force. Tangible and measurable results that create real benchmarks give employees targets to hit. Still, creating a consistent function across 36 countries is no easy task. To do so, DiDonato relies heavily on regional leaders who are given the freedom to implement plans developed as a team based on the business goals at their discretion. “How each key player puts the plan into action is up to them, DiDonato says. “I don’t show Brazil exactly what to do, but I tell them we must hit certain goals. Then, they apply their own genius to how it gets down.” With all team leaders following an identical overriding strategy, results should be the same even if they are delivered through varying methods. Once employees become part of Lear Corporation, DiDonato looks to provide support and room for growth. “Getting the right people to the right jobs is critical, and you’ll never attract them if you don’t have the culture to support them,” he says. To do so, DiDonato looks for ambitious, aggressive candidates that are looking for advancement. “If you hire tigers, you better feed them,” he quips. Ambitious workers, after all, have high expectations. They need not only compensation, but a culture where they can develop, seize opportunities, and ultimately find a progressive and rewarding career path.